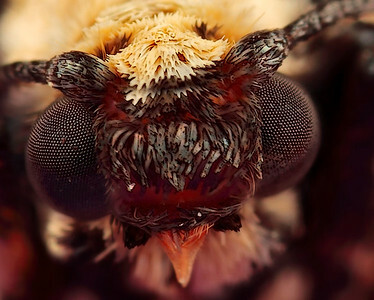 Frontal portrait of a moth, made with magnification 8 and f/8 using a Canon 7D, a Canon macrolens MP-E 65mm/f2.8 and a Canon 2x teleconverter. A moth is an insect closely related to the butterfly, both being of the order Lepidoptera. Moths form the majority of this order; there are thought to be 150,000 to 250,000 different species of moth (about ten times the number of species of butterfly), with thousands of species yet to be described (source: Wikipedia).